The far-distant planet which was the home world of Superman until it exploded into fragments as the result of a cataclysmic chain reaction originating at the planet's core. It was as the doomed planet shuddered and rumbled in its dying moments that the Kryptonian scientist Jor-El and his wife Lara placed their infant son in an experimental rocket ship and launched him into the void, eventually to arrive on the planet Earth and to grow to maturity there as Superman. Krypton was a planet of giant size located somewhere in the outer reaches of trackless space. Described as an unusual planet with a unique atmosphere and a tremendous gravitational pull far greater than that of Earth, Krypton had a massive uranium core and was occasionally swept by windstorms so violent that the planet's tallest skyscrapers had to be lowered into the ground to prevent their being toppled by the powerful gales. Although a number of texts seem to place Krypton in the same solar system as that of Earth - somewhere past Mars, Jupiter, and Saturn - the vast preponderance of textual evidence places the planet of Superman's birth in a distant solar system, revolving about a red sun - as distinguished from Earth's yellow sun - at the rate of approximately one revolution per 1.39 Earth years. Born almost six billion time-cycles ago - six billion time cycles being the equivalent of approximately 8.3 billion Earth years if one assumes that the terms "sun-cycle" and "time-cycle" are synonymous - the planet Krypton occupied the same solar system as the planet Thoron and was orbited, at various times in its history, by two, three, and perhaps even four natural satellites. When, in November 1960, Superman makes a time-journey to Krypton in the period immediately preceeding its destruction, he romances lovely Lyla Lerrol under the soft radiance of Krypton's two moons; but it is firmly established in the chronicles that the renegade Kryptonian scientist Jax-Ur destroyed one of Krypton's moons prior to this period, a heinous crime for which Jax-Ur was banished into the Phantom Zone, clear evidence that Krypton had three moons - one of which was evidently named Koron - in the not-too-distant past. In addition, Xenon, the so-called twin world of Krypton, was evidently Krypton's fourth moon, sometime in the ancient past, until it spun out of its orbit and left Krypton forever. Although the planet Krypton was much like Earth in a multitude of ways - it is even called Earth's sister world in Superman #53 (1948) - Krypton's atmosphere and solar radiation were substantially different from Earth's and the weight of its gravity was incredibly stronger. The distance from Earth to Krypton has never been established with absolute certainty, but scientist Mel Evans has estimated the probable distance at 0.317 light years. The Three Sisters of Krypton, a trio of great fire-geysers so named because they always erupted simultaneously. Other natural wonders of Krypton included Shrinkwater Lake, whose waters contained some strange chemical that could shrink ordinary men down to ant size; Great Krypton Lake, which was ultimately contaminated by the evil Professor Vakox; and the Great Krypton Sea, whose waters were once the home of a highly advanced civilization. Other of Krypton's geographical features are enumerated on the accompanying map. The metal-eater, a large metal-eating animal resembling a giant tapir. When Superman makes a time-journey to Krypton in November 1960, he encounters a fire-breathing space creature - a pink, leopardlike animal, with a horn like that of a unicorn protruding from its forehead, which breathes super-powerful flames when angered - on display in a Kryptonian zoo. It is unclear, however, whether this animal is indigenous to Krypton, or whether the Kryptonians merely collected the specimen on some far-distant planet. The singing flowers, which would softly serenade guests at Kryptonian dinner parties. Krypton's strongest metal was kryptium, a super-metal described as harder and stronger than any Earth metal. Krypton's most precious metal was boradium. Gold was so commonplace on Krypton as to be literally worthless. Krypton was an advanced civilization, with people of great intelligence and physical perfection. The planet was apparently divided into a series of separate nations, but these nations had long since combined to form a planet-wide union, uniting all Kryptonians under a single flag, a single government, a single constitution, and a single planet-wide language, Kryptonese. Possessed of high intelligence, the people of Krypton had built a super-scientific civilization far beyond that of Earth. Crime was virtually unknown on Krypton and there had been no war on the planet for thousands of years. Capital punishment was unknown, and Kryptonians were bound, in all their dealings with each other, by a strict Kryptonian Code of Honor. Indications are that they were a freedom-loving people who would have preferred death to dictatorship. Perhaps one explanation for the comparative lack of strife on Krypton lay in the relative sparseness of the population, for despite the vast size of the planet, its population may have numbered only in the millions. According to Superman #53, Krypton's inhabitants were humans of high intelligence and magnificent physical perfection. Although several early texts refer to them as Kryptonites, the vast majority of texts refer to them as Kryptonians, describing them as a super-scientific, intelligent people and as a great people, physically perfect and of immense intelligence and science. On the planet Krypton, explains Action Comics #233 (1956), even three-year-olds could solve complex mathematical equations. The Kryptonian system of government is never cleary described in the chronicles, but it is clear that the scientific establishment commanded wide respect and exerted considerable influence on political and social policy. The Council of Five, a body of distinguished scientists who, if they did not actually govern the planet themselves, obviously carried much weight with those who did, is mentioned in Superman #53 and there are numerous references in other texts to the Council, the Science Council, and the Council of Scientists. A few sources name Ro-Zan as the leader of this Council. Superman #65 makes reference to Krypton's ruling council, which consisted of the planet's ten leading scientists, a clear suggestion that Krypton's leading scientific body governed the planet, but Action Comics #223 distinguishes between the Council of Science and Krypton's highest officials, suggesting that the Council, while influential, was not really charged with the responsibility of ruling the planet. Superman #154, however, contains a brief reference to a Supreme Council, a title clearly suggestive of supreme political authority. All in all, then, it is probably safest to infer that Krypton was ruled by a political body, probably elected, which was counseled and advised by a body of distinguished scientists exercising considerable influence over political decision making. 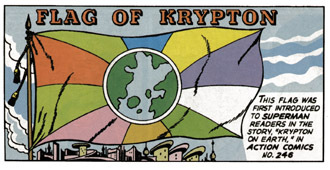 The capital of Krypton was the city of Kandor. Several years before Krypton exploded, however, Kandor was reduced to microscopic size and stolen by the space villain Brainiac, and a new world capital was established in the city of Kryptonopolis, the city which would later become Superman's birthplace. Fluttering from the flagstaff atop the World Capitol Building - which, like the city of Kryptonopolis itself, had been designed by Superman's ancestor Gam-El, the father of modern Kryptonian architecture - was the flag of Krypton, a multicolored banner consisting of pale rays of blue, yellow, lavender, white, green, orange, pink, light green, and red radiating outward from a circular center featuring a green and pale blue design suggestive of a body of water all but encircled by lush green land. Maintaining public order was the role of the Krypton Security Force, while the task of maintaining internal security and apprehending criminals was entrusted to the Krypton Bureau of Investigation. Crime was only a minor problem on Krypton. Indeed, the research of the Kryptonian scientist Raf Arlo had established that most of the crimes on the planet were perpetrated by an unknown race of invisible people. When malefactors were apprehended, they were placed on trial in Kryptonian courtrooms where verdicts were handed down by Kryptonian justice councils, deliberate bodies analogous to American juries. Because Kryptonians were opposed to capital punishment, and, in fact, had never in their history practiced it, the perpetrators of serious crimes were exiled into space in a state of suspended animation inside space capsules constructed specially for the purpose. According to Superman #65, the space capsules were made of transparent plastic and shaped like rocket ships, but according to Superman #123, the so-called "prison satellites" were of a spherical shape. The criminals imprisoned inside them were placed in suspended animation by means of a special sleep gas, and chunks of a glowing crystalline mineral - capable of cleansing their brains of criminal tendencies in a hundred years' time - were placed on their foreheads so that ultimately, once their sentence was served, they might take up constructive roles in Kryptonian society. The practice of exiling criminals into outer space was terminated, however, after Superman's father, Jor-El, discovered the Phantom Zone, a twilight dimension to which criminals could be banished to serve out their sentences as disembodied wraiths. One of the most important government departments was the Krypton Record Bureau, where complete records of every Kryptonian's life were maintained on ingenious thought-projection discs. According to Action Comics #149, such important events as courtship and marriage were recorded astro-electricly, from each person's memory. By concentrating on one of those discs - in a darkened room - anybody could cause a complete image of remembered events to appear. Scientifically and technologically, Kryptonian civilization was far advanced over that of Earth. Although the science of space travel was still in its infancy and true spaceships did not yet exist, Kryptonian scientists - most notably Jor-El - had experimented with both manned and unmanned satellites and had launched monkeys, at least one dog, and perhaps other test animals into outer space in small experimental rockets. Astronomy on Krypton was highly advanced, enabling Kryptonian scientists to study Earth and presumably other planets with excruciating clarity by means of super-powerful telescopes, even to the extent of being able to tune in on selected alien individuals and monitor and translate their private conversations. Despite the lack of spaceships for interplanetary travel, transportation on Krypton was highly developed. People voyaged about the planet aboard sleek, rocketlike airships, or flitted about Krypton's picturesque metropolises - such as Kandor, Kryptonopolis, and Argo City - in bubble-topped jet-taxis or by means of jetlike devices called solo-rocket tubes which, strapped to an individual's back, enabled him or her to fly through the air. Travel underwater was by means of a small rocket-powered craft known as an aqua-cone, and virtually every Kryptonian family owned its own "Jor-El," an all-purpose, mass-produced vehicle, invented by Superman's father, which could travel on land, sea, or air, and even underground. Sophisticated weather control towers enabled the people of Krypton to purify their air and control their weather, while an advanced solar energy tower enabled them to store and utilize the solar energy emanating from their planet's red sun. In homes that were apparently heated by atomic power, Kryptonian families entertained themselves by watching 3-D TV while, outside in the streets, other Kryptonians moved along the city's moving sidewalks, gazing at the public news monitor a billboard sized color-TV screen - to keep abreast of current events, watching other Kryptonians queuing up for emotion-movies, or visiting the incredible Mind-Art Center, where, by means of a complex apparatus called a "mento-ray," designed to freeze the artist's mental pictures on canvas, Kryptonian artists created art masterpieces by merely envisioning them in their minds. The Cosmic Clock, a gigantic timepiece, measuring time in billions of years, which showed how Krypton was born almost six billion time-cycles ago and which, tragically, lulled the people of Krypton into a false sense of complacency concerning the future of their planet by predicting, incorrectly, that Krypton would remain safe from all harm for endless years into the future. The most important Kryptonian literary achievement was the Kryptoniad, a great epic chronicling the struggle of ancient Kryptonians to transform their planet into a civilized world. On Krypton, robots performed all hard labor and could be bought at small cost. Heavy construction work was accomplished by means of sophisticated building machines. Although Kryptonians had at least one serious disease, Virus-X, for which there was no known cure, childhood diseases were not a problem: filing through a health cabinet on their first day of school, Kryptonian children were immunized against all childhood diseases by means of an ingenious microbe ray. Injuries were apparently not a problem either, as even potentially fatal wounds could be healed almost instantaneously by means of a miraculous healing ray employed by Kryptonian surgeons. In Kryptonian schools, lessons were taught with the aid of sophisticated telepathy helmets which enabled teachers to transmit knowledge to their pupils telepathically at phenominal speed. The treatment of psychological problems - as well as the investigation of misconduct of all kinds was facilitated by an ingenious mind-reading device known as a mind prober machine, and mental retardation had all but ceased to be a problem thanks to the pioneering work of scientist Lon Gorg, whose supra-psyche treatments successfully transformed morons into geniuses. Historically, famine apparently had afflicted certain areas of Krypton, but an amazing growth ray for plants, invented by Superman's father and capable of growing vegetables 100 times bigger than their normal size, promised to end the problem of hunger forever within a very short time. In Kryptonian society, descent and inheritance were patroclinous. The names of most - but by no means all - Kryptonian males were duosyllabic, with the first syllable being the given name, the second the surname. Thus, Jor-El was the brother of Zor-El and the father of Kal-El, Kal-El being Superman's Kryptonian name. Than-Ar was the brother of Jhan-Ar, and Mag-En was the father of Ral-En. Sometimes first and last names were linked by a hyphen (e.g., Jor-El, Quex-Ul, Mag-En). Just as often, however, they were not (e.g., Val Arn, Khai Zor, Than Ol). And some names, it must be noted, appear to have defied the system entirely (e.g., Mala, Kizo, General Zod). Many of the most revered figures in Kryptonian history were members of the so-called House of El and were, therefore, ancestors of Superman. Among them were Val-El, who launched his planet's Age of Exploration and discovered islands and continents; Sul-El, who invented Krypton's first telescope and charted many far off stars, including Earth's sun; Tala-El, a great lawyer and statesman who authored Krypton's planet-wide constitution; and Hatu-El, who discovered the nature of electricity, proved that lightning was electrical, and invented Krypton's first electric motor. Each female child on Krypton was given a special feminine first name (e.g., Kara, Lara, Joenne), which, when followed by her father's name, formed her own full name, so that Kara Zor-El, for example, was Kara, the daughter of Zor-El. When a woman married, she dropped her father's name and assumed her husband's: when Lara married Jor-El, for example, she became Lara Jor-El, or, more formally, Mrs. Jor-El. Weddings took place in the Palace of Marriage, with the betrothed couple mounting the Jewel of Honor, or Jewel of Truth and Honor - a low pedestal carved from a single, huge, multifaceted jewel - and exchanging vows, accompanied either by an exchange of wedding rings or by the donning of marriage bracelets of a color variation all their own, which no other couple was allowed to duplicate. In accordance with an old Kryptonian custom, statues of the parents of both the bride and the groom adorned the wedding hall. 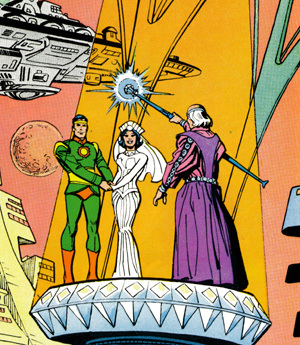 According to the Supergirl story in Action Comics #289, marriage between cousins was prohibited on Krypton. Although the Kryptonians were, by and large, an intellectually sophisticated people, they were not without their superstitions. According to Superman #164, which enumerates four Kryptonian superstitions, it was considered bad luck for a bride to wear jewels from the Jewel Mountains at her wedding; the killing of birds was regarded as extremely unlucky, hence the absence of bird hunting on Krypton; an old Kryptonian belief dictated that upon seeing a comet, a person must hide in a cave for 24 hours or he'd die; and Kryptonian criminals believed that if they experienced failure, drawing a picture of a Kryptonian mythological creature known as a "one-eyed grompus" would cause Krypton's demons to bring them good luck. A holiday of great importance on Krypton was the Day of Truth, celebrated annually, on which Kryptonians spoke nothing but the truth to one another - even though the truth might be abrasive and undiplomatic - in order to honor the memory of Val-Lor, a valiant Kryptonian of ancient times, who, by courageously speaking out against the ruthless swarm of alien invaders - known as Vrangs - who had invaded Krypton and enslaved its people, inspired his fellow Kryptonians to revolt against the Vrangs and drive them from Krypton, albeit at the cost of his own life. The Day of Truth is still celebrated each April in the bottle city of Kandor. By the time Krypton's day of doom arrived, Kryptonian civilization was 10,000 years old. Action Comics #1 observes that Superman's home planet was destroyed by old age, but Action Comics #182 explains, with far greater accuracy, that Krypton's destruction was caused by gathering atomic pressure at the core of the planet. Jor-El had correctly predicted that the end was coming, but he had been unable to either prevent its occurrence or to persuade the scientific community to adopt his proposal for the construction of a fleet of rocket-driven space arks to enable Krypton's population to flee the coming cataclysm. "The core of Krypton," Jor-El had warned, "is composed of a substance called uranium, which, for untold ages, has been setting up a cycle of chain-impulses, building in power every moment! Soon, very soon, every atom of Krypton will explode in one final terrible blast! Krypton is one gigantic atomic bomb!" But the people of Krypton would not believe Jor-El, not even when the quakes began, not even when a rumble of mighty forces erupted from deep inside Krypton that shook the home of every Kryptonian. And then finally, the rumblings inside Krypton became a roar and the planet shook wildly. As the edifices of a once-proud civilization collapsed like building blocks amid choking clouds of dense clank smoke, nature's fury gathered for one final cataclysmic eruption and the once mighty planet Krypton exploded into stardust. The titanic interstellar explosion that destroyed Krypton transformed the hurtling remnants of the shattered planet into kryptonite, a glowing, green, radioactive substance which is toxic - and potentially fatal - to all Kryptonian survivors. "When Krypton exploded," explains Superman #61, "all the atomic elements fused to become one deadly compound! That compound gives off rays which apparently can only affect Kryptonites!" The flame dragon that runs amok on Earth in January 1961 and the offspring, hatched from one of its eggs, that menaces Earth in February 1962. The inhabitants of Argo City survived for more than fifteen years following the death of Krypton after their city had been hurled into outer space by the force of the cataclysm. Virtually the entire population, however, ultimately succumbed to kryptonite poisoning, the only survivors of the calamity apparently having been Supergirl and her parents, Zor-El and Alura. Far from perished Krypton, in the alien environment of Earth, any Kryptonian survivor acquires mighty super-powers - including X-ray vision, invulnerability, super-strength, and the power of flight - and all things Kryptonian become indestructible. The relative physical strength of two Kryptonian survivors on Earth appears to be proportional to what it was - or would have been - on Krypton, so that a Kryptonian gorilla on Earth is more powerful that Superman, just as an ordinary Kryptonian gorilla would have been more powerful than an ordinary Kryptonian man. Of course the vast majority of Kryptonians perished with their planet, but a number of these have nevertheless planed important roles in the chronicles, among them Jor-El and his wife Lara; lovely emotion-movie actress Lyla Lerrol; and famous psychologist Mag-En and his unscrupulous son Ral-En. According to Action Comics #243, the legendary enchantress Circe was herself a native of the planet Krypton. Superman has made an extensive study of his home planet by overtaking and photographing light rays that had left Krypton before it exploded. He has donated exhaustive notes on the Kryptonese language to Metropolis University. Superman has memorialized the lost world of Krypton in other ways as well: he has set aside an entire Krypton Room in his Fortress of Solitude - complete with an exact scale model of Krypton and a 3-dimensional tableau of the exact moment that the planet Krypton exploded - and, with the aid of Supergirl and Krypto the Superdog, he has transformed an uninhabited planet in a distant solar system into an exact duplicate of Krypton, a memorial planet inhabited by android duplicates of the entire Kryptonian population. A statue of Superman holding aloft a globe of Krypton adorns the grounds of Metropolis' Superman Museum. The anniversary of the destruction of Krypton is commemorated annually by the people of Kandor and all the remaining Kryptonian survivors. Text on this page taken from The Great Superman Book © 1978 by Michael L. Fleisher.